What Was I Scared Of? is from the book, The Sneetches and Other Stories by Dr. Seuss. In this this short story the narrator is afraid of the green pants. Sounds totally silly right? Of course, who’s really afraid of green pants? The narrator eventually realizes that the pants were also scared of him. This story teaches kids not to be afraid of things that aren’t familiar. Encourage kids to be curious and explore. We should live up to that same standard. We always try and say to kids that there’s nothing to be scared of. I’d argue this isn’t the best approach, though. How many things are you scared of which by having someone say – there’s nothing to be scared of – is totally meaningless? It’s like pretending it doesn’t exist in that case. Face it. Explore it. Understand it. Empower yourself. One can argue that there’s an instinctual reason to be scared of the unknown. Sure that might be the case and there are also real anxiety disorders relating to fear. This is different though. It’s not really the object we’re scared of though. Fear of the unknown. You can go through life continuing to be scared of the unknown or you can experience things and make decisions based on whether or not you like it. How many times have you tried something new and it killed you? Never. Or you wouldn’t be reading this. 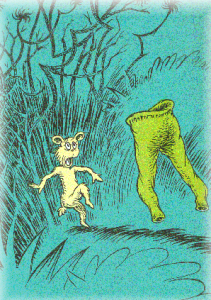 The narrator was scared of the green pants similar to that dream where you wake up and are going to school without pants. How many times did that really happen to you? Be honest. The reality is being scared of something when we don’t even know it is a cop out. Try it. You might like it. For the record, I won’t be wearing green pants tomorrow. What situations have you been in that had scared of something you never even tried (and lived to tell about it)?